Over the past few months I have been lucky enough to spend time with some legends of this game. As a result, I’ve learned a lot about the way things were, and probably should still be done. ‘Hit it further’, ‘work harder’, ‘play faster’ are just a few of the taglines we are exposed to these days. These are all before the ‘disconnect retreats’ and self-help audio books, widely viewed as solutions to our universal problem. Six months ago I started working ‘with, not for’ (as he constantly reminds me) golf course designer Peter Matkovich. This short story is based on the most important word he has taught me the true meaning of: time. Having been on site for a few projects with Peter in 2018, the first thing he says with a warm smile to every new client when they ask him where the clubhouse should be, or whether the 18th green should be on its own island, is, ‘time’. That is what every project needs, before anything else. The reason he’s said this to me in the past (without the smile), was either because I stepped into a meeting after it had started or I picked him up from an airport five minutes late. Neither of which I am particularly proud, but I have made a point to improve daily, which has shifted my life towards some pretty great moments. Thanks, Matko. Soon after this life lesson from Peter started to sink in, I was asked to be the guest speaker at the Mashonaland Nomads 50th anniversary celebration. Typically, I would rush through my speech, but not that night. 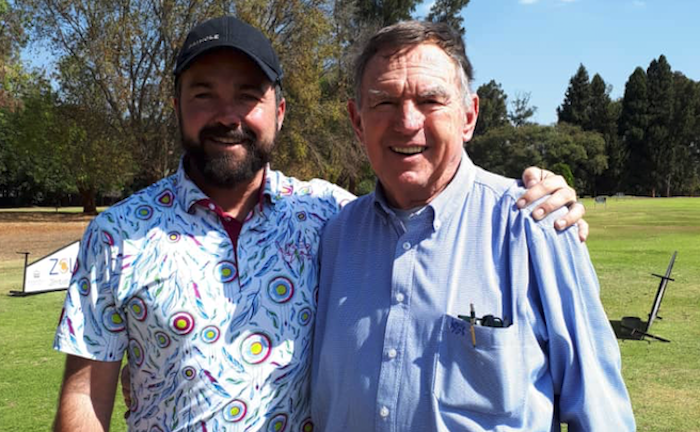 Despite nervously stepping up to the podium in a room filled with an incredible group of gentlemen who my wife calls the ‘Golf Angels’, I was able to deliver a recollection of short stories, from growing up in the Nomads-supported system of Zimbabwe Junior Golf to their continued presence every week on the Sunshine Tour. After the formalities and a (welcome) warm response to my 15-minute slot in the evening’s programme, Lize and I spent the rest of the night listening to some Nomads members’ classic tales of old, as we made our rounds to almost every table. From how Nick Price rode his bicycle to hit balls at Warren Hills every day to an annual cross-country golf event played between two courses, and the kilometre of bushveld between them. We loved every minute of that night. ‘Time’ changed so much for me in 2018, as I’ve always been guilty of having too much on my plate (according to my mom). When Lize and I moved into our home in Harare, a part of our garden struck me as the perfect spot for a gazebo/tiki bar, to host friends and family on the weekends. Of course, with my ‘full plate’ and ‘no time’, months went by without any change. When my brother arrived from London recently, he stayed with us for a few weeks before heading back to university. It felt like the perfect opportunity for us to spend some quality time together, and what better way to bond with your little brother than by building a bar? The day after my suggestion, we sourced the materials from a local market, strapped on the tool belts and got to work. In just a few hours, we had built what is already a place full of amazing memories spent with our family and friends. The year 2019 is here. Do you remember your Millennium New Year’s Eve party? Well, the babies who were born after that night are now studying for their undergraduate degrees at university. Savour the moments with family and friends this year. Make time, but still keep up with the group in front of you.